Once the model economy of transition, Hungary has been struggling with much higher public and private debt and a significantly worse growth performance than its peers in the region. A deteriorating exchange rate, increasing yields on government securities and soaring CDS spreads have recently forced the Hungarian government to seek financial assistance from the IMF and the European Union. 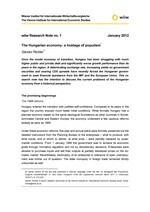 This research note has the intention to discuss the current problems of the Hungarian economy from a historical perspective.